The event was attended by the Ambassadors Extraordinary and Plenipotentiary of the member-states to the "Basic Multilateral Agreement on International Transport for Development of Corridor Europe-Caucasus-Asia (MLA) TRACECA, the representatives of various international organizations, as well as all diplomatic missions accredited in the Republic of Azerbaijan. His Excellency Mr. Nicolae Ureche made a welcoming speech, stressing the need and importance of developing closer relations with Azerbaijan. 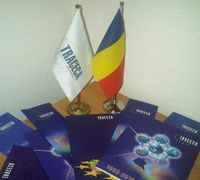 It should be noted that Romania, which joined TRACECA in 2000, is an active and effective member of TRACECA. Reception was held in a friendly and warm atmosphere.